It’s time to get the hand fan out. 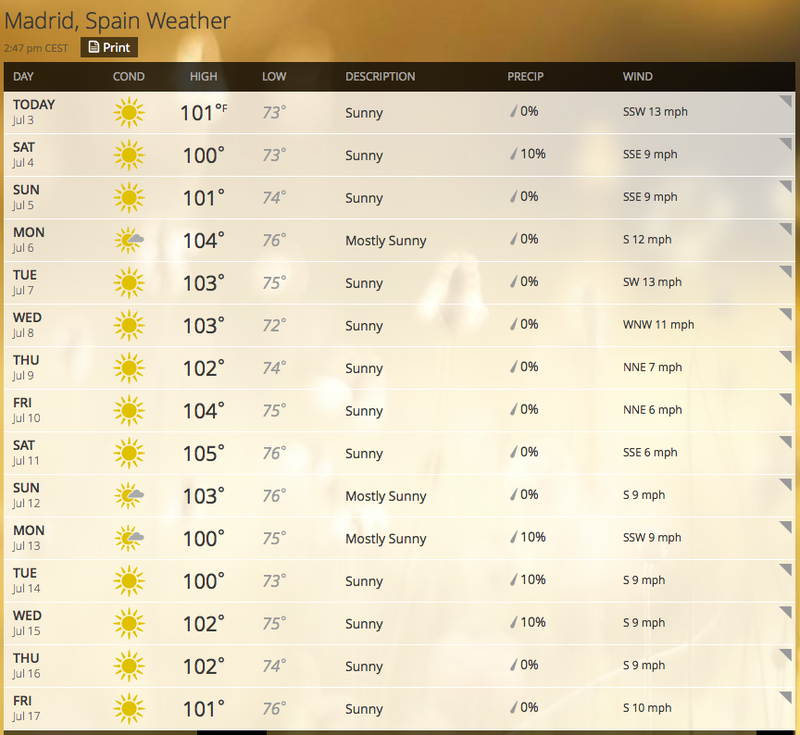 And other Spain weather thoughts. A couple years after moving to Spain I had one of my “I am becoming spanishized” moments: it was sweltering hot out, and I pulled out my mini hand fan from my pocketbook to cool myself off. My first thought was, “why did I wait to so long to get one of these? ?” I remember the first time my mother saw me pull one out and gave me a look like I had completely lost it. I had to explain that, believe it or not, this little piece of genius wasn’t just a funny tourist item, but actually something that makes sense over here. With temperatures rising above 100 degrees since last week and for at least another week or so, it’s time for me to get the hand fan out. When I first moved to Spain I remember seeing people on the streets, in the metro, simultaneously while drinking a caña (ambidextrous? ), pretty much everywhere, using their hand fans to ward off the hot weather. At first it seemed funny and something more like an older woman concept. However, it’s not just a thing to laugh at anymore when you realize it actually helps. We even handed out hand fans as one of several party favors (“detalles”) at our wedding. Writing about the weather makes me remember a funny thing that happened to me a few years ago at the office… as you probably already know from reading this blog, I’m from Boston and am used to the cold weather (important: this does not mean that I like it). Now, when I say cold weather, I mean really cold, not just chilly. It always seemed amusing to me when the weather in Madrid would drop to the 50s (fahrenheit) and everyone would start saying how cold it was, at the same time they would adjust their neck scarves to keep out the winter chill. This entry was posted in Clothing/Accessories Spain, Life in Spain, Miscellaneous, Weather Spain and tagged Madrid hot weather relief, Spain hand fans, Spain weather curiosities on July 3, 2015 by Michelle.